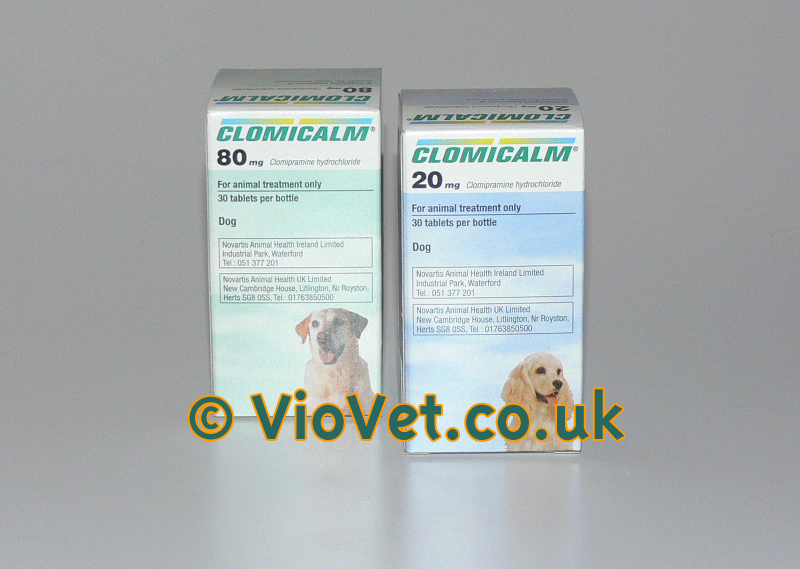 Clomicalm is used to help with behavioural problems in dogs. It acts on the brain to make the dog more receptive to new learning, reducing the tendency to follow old behaviour patterns. It only works if there is a change in the way the dog is handled or trained at the same time. The dog will be more open to new learning, but just giving the Clomical and hoping for the best will not work alone. A typical course lasts for about 2 or 3 months, depending on results. If there is no improvement after 2 months there is not point in continuing medication. If there are improvements being made, then it is helpful to prolong the course. Clomical can be used for dogs which are destructive or toilet indoors when left alone, or certain other types of obsessive or compulsive type behaviours or aggression. It needs to be prescribed by your vet, and you should get expert advice on behavioural training too. Clomicalm should not be used with certain other drugs, or on dogs under 6 months of age. Care must be taken if Clomicalm is used in epileptic dogs or those with heart problems. Each tablet of Clomicalm contains: Active substance: Clomipramine hydrochloride 5 mg (equivalent to 4.5 mg Clomipramine) Clomipramine hydrochloride 20 mg (equivalent to 17.9 mg Clomipramine) Clomipramine hydrochloride 80 mg (equivalent to 71.7 mg Clomipramine) Excipients: For a full list of excipients, see section pharmaceutical particulars. As an aid in the treatment of separation-related disorders in dogs manifested by destruction and inappropriate elimination (defaecation and urination) and only in combination with behavioural modification techniques. Do not use in case of known hypersensitivity to clomipramine and related tricyclic antidepressants. Do not use in male breeding dogs. The efficacy and safety of Clomicalm has not been established in dogs weighing less than 1.25 kg or under six months of age. In children, accidental ingestion should be regarded as serious. There is no specific antidote. In case of accidental ingestion, seek medical advice immediately and show the product label to the physician. Overdose in human beings causes anticholinergic effects although central nervous and cardiovascular systems may also be affected. People with known hypersensitivity to clomipramine should administer the product with caution. Clomicalm may very rarely cause vomiting, changes in appetite, lethargy or an elevation in liver enzymes, which is reversible when the product is discontinued. Hepato-biliary disease has been reported, especially with pre-existing conditions, and concurrent administrations of drugs metabolized via the hepatic system. Vomiting may be reduced by co-administration of Clomicalm with a small quantity of food. The safety of the veterinary medicinal product has not been established in female dogs during pregnancy and lactation. Laboratory studies in mice and rats have shown evidence of embryotoxic effects. Recommendations on the interaction between Clomicalm and other medicaments are derived from studies in species other than dogs. Clomicalm may potentiate the effects of the anti-arrhythmic drug quinidine, anticholinergic agents (e.g. atropine), other CNS active drugs (e.g. barbiturates, benzodiazepines, general anaesthetics, neuroleptics), sympathomimetics (e.g. adrenaline) and coumarin derivatives. The administration of Clomicalm is not recommended in combination with, or within 2 weeks of therapy with, monoamine oxidase inhibitors. Simultaneous administration with cimetidine may lead to increased plasma levels of clomipramine. Plasma levels of certain anti-epileptic drugs, such as phenytoin and carbamazepine, may be increased by co-administration with Clomicalm. Amounts to be administered and administration route Clomicalm should be administered orally at a dose of 1-2 mg/kg clomipramine twice daily to give a total daily dose of 2-4 mg/kg according to dosage guide below. At overdose with 20 mg/kg Clomicalm (5 times the maximum therapeutic dose), bradycardia and arrhythmias (atrioventricular node block and ventricular escape beats) were observed approximately 12 hours after dosing. Overdose with 40 mg/kg (20 times the recommended dose) of Clomicalm produced hunched posture, tremors, flushed abdomen and decreased activity in dogs. Higher doses (500 mg/kg i.e. 250 times the recommended dose) produced emesis, defecation, drooped eyes, trembling and quietness. Still higher doses (725 mg/kg) produced, in addition, convulsions and death. Clomipramine has a broad-spectrum of action in blocking the neuronal reuptake of both serotonin (5-HT) and noradrenaline. It therefore possesses the properties of a serotonin re-uptake inhibitor and a tricyclic antidepressant. The active components in vivo are clomipramine and its major metabolite, desmethylclomipramine. Both clomipramine and desmethylclomipramine contribute to the effects of Clomicalm: clomipramine is a potent and selective 5-HT reuptake inhibitor while desmethylclomipramine is a potent and selective noradrenaline reuptake inhibitor. The principle mechanism of action of clomipramine is potentiation of the effects of 5-HT and noradrenaline in the brain by inhibiting their neuronal reuptake. In addition, clomipramine has anticholinergic effects by antagonism of cholinergic muscarinic receptors. Clomipramine is well absorbed (>80%) from the gastrointestinal tract in dogs when administered orally but the systemic bioavailability for clomipramine and desmethylclomipramine is 22-26% due to extensive first pass metabolism by the liver. Peak plasma levels of clomipramine and desmethylclomipramine are rapidly reached (approx. 1.5-2.5 hours). The maximal plasma concentrations (Cmax) after oral administration of single doses of 2 mg/kg clomipramine hydrochloride were: 240 nmol/l for clomipramine and 48 nmol/l for desmethylclomipramine. Repeated administration of Clomicalm causes moderate increases in plasma concentrations, accumulation ratios after oral administration twice daily were 1.2 for clomipramine and 1.6 for desmethylclomipramine, with steady state being reached within 3 days. At steady state, the ratio of plasma clomipramine to desmethylclomipramine concentrations is approximately 3:1. Administration of Clomicalm with food causes moderately higher plasma AUC values for clomipramine (25%) and desmethylclomipramine (8%) as compared with administration to fasted dogs. Clomipramine is extensively bound to plasma proteins (>97 %) in dogs. Clomipramine and its metabolites are rapidly distributed in the body in mice, rabbits, and rats with high concentrations being achieved in organs and tissues (including the lungs, heart and brain) and low concentrations remaining in the blood. In dogs, the volume of distribution (VDss) is 3.8 l/kg. The major route of biotransformation of clomipramine is demethylation to desmethylclomipramine. Additional polar metabolites also exist. The elimination t1/2 after intravenous administration of clomipramine hydrochloride in dogs was 6.4 hours for clomipramine and 3.6 hours for desmethylclomipramine. The principle route of excretion in dogs is via the bile (>80%) with the remainder via the urine. One HDPE bottle with child resistant closure and sealing disk, containing 30 tablets and one silica gel desiccant sachet, packed within a cardbox. There are currently no questions for Clomicalm for Dogs - be the first to ask one!